GREEN John Keller better keep today’s newspaper, because otherwise, his grandchildren aren’t going to believe him. 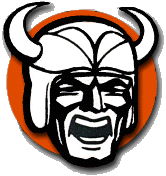 In the first Federal League victory of his high school career, the Hoover quarterback went from struggling sophomore to folk hero, throwing for six touchdowns and running for another to rally the Vikings to a 48-42 victory on Friday night at Green Memorial Stadium. Even in a video game? After falling behind 14-0 after the first quarter, Keller threw for five touchdowns in the second, helping Hoover grab a 34-28 halftime lead. Three of those passes went for at least 60 yards, as the Vikings torched the second level of Green’s defense thanks to Keller’s scrambling and Hoover’s speed. Keller’s last touchdown, a 7-yard run with just under five minutes left, gave the Vikings a 48-28 lead and appeared to put the game out of reach. But Green wasn’t done. Bulldogs quarterback Tanner Montgomery hit three quick passes, the last for 22 yards to Eric McKinstry, to cut the deficit to 48-35 with 3:41 left. The Bulldogs appeared to recover the ensuing onside kick, but the official ruled they touched it before it traveled 10 yards. After a quick Hoover punt, Montgomery hooked up with James Angel for 68 yards, then found him again from 3 yards out to make it 48-42 with 1:18 left. But the onside kick went out of bounds, Hoover ran off most of the clock and Montgomery’s desperation heave from the Green 41 got picked off on the game’s final play. The win snapped Hoover’s five-game losing streak and gave first-year coach Brian Baum his first league win. “The kids started believing in themselves,” said Baum, whose team hadn’t won since beating Brush in Week 1. “It’s tough on all of us to go through a losing streak, but I knew this job was gonna be a challenge. I wanted the challenge and tonight is exactly why I wanted this. Montgomery completed 18 of 31 passes for 379 yards, but had three interceptions. The Bulldogs (3-4, 0-3) also lost a fumble at their own 20 early in the third quarter that led to a quick Hoover touchdown. Angel finished with eight catches for 189 yards. Jeremy McAleese ran for a game-high 156 yards on 21 carries, scoring twice for Green.